Susan Hicks was riding her bike Oct. 23 the exact way Pennsylvania law required her to: as if she were driving a car. The 34-year-old University of Pittsburgh educator pulled her bike behind an SUV, just as she would have a car, and waited for a left-turn signal at a red light on Forbes Avenue, in Oakland. Another car then pulled behind her. When a third vehicle rammed into that car from behind, the chain reaction crushed Hicks between the car and the SUV. She was taken to the hospital but died of her wounds hours later. According to news reports, the driver who initiated the chain reaction, who was uninjured, did not appear to be drunk and did not flee the scene. Hicks’ story has rallied the community; every news outlet covered the aftermath, and Mayor Bill Peduto called for safer streets. But bike experts say Pittsburgh is still at least 10 years away from a more complete and safe bike infrastructure system citywide. How to keep the growing number of cyclists safe until then? A ghost bike marking the spot on Forbes Avenue where cyclist Susan Hicks was killed. The answer could come from a combination of tactics. Some are being pursued — protected bike lanes, increased education about bikes on city streets. Some, like creating new state laws to increase safety for cyclists and pedestrians, need state legislators to act. But for the immediate future, safety for cyclists might come down to simply enforcing laws on drivers who crash into bikers. No charges have been filed in Hicks’ case against the driver who started the chain reaction, and Hicks’ death was ruled accidental by the Allegheny County Medical Examiner’s office. The incident is currently under investigation, but local bike advocates say crashes like these seldom end with punishment of the driver. Reisman says that pursuing a vehicular-manslaughter charge against a driver demands satisfying a “high legal standard.” For the charge to stick, he says, a driver must be considered grossly negligent or to have been recklessly driving (i.e. speeding while tailgating and erratically changing lanes or falling asleep at the wheel). But a manslaughter charge is not the only enforcement avenue available. Reisman says that minor citations could also be issued to drivers involved in bike collisions. Among the hundreds of bike-related cases he has worked on, Reisman says, he rarely has seen a citation issued even if an officer notes on a police report that a violation could be issued. Streets are dangerous for pedestrians, as well. 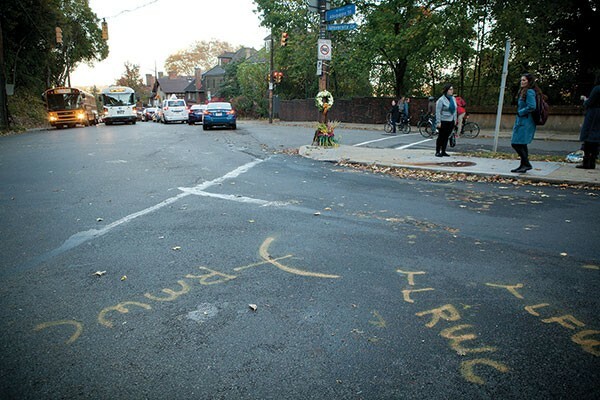 Two pedestrians were killed on Oct. 26 at the intersection of Allequippa Street and Centre Avenue, in Oakland. According to Reisman, possible citations include: failing to yield the right of way; turning left at an intersection in front of an oncoming cyclist; careless driving; and violating the state law requiring four feet of clearance when passing a cyclist. Reisman says he has heard of only one four-foot violation issued in the city since the law took effect in 2012. Pittsburgh public-safety spokesperson Sonya Toler did not return calls and emails requesting comment for this story and for updated numbers on cited violations of the four-foot rule. At the time that CP last reported on the four-foot rule, in August 2014, Allegheny County had recorded 12 citations in that first two-year span, according to court data. Drivers going uncited in fatal crashes is not a new phenomenon. In July 2012, Anthony Green was struck on Penn Avenue near the Pittsburgh/Wilkinsburg border by Danielle Thompson, who was driving without a valid driver’s license. Green died as a result of the crash. Scott Bricker, director of Bike PGH, says he followed up for months after the incident but never received word whether Thompson would be charged. Allegheny County criminal records show no charges associated with a Danielle Thompson matching the case. “Why is there no accountability when a driver hits a cyclist?” asks Ed Quigley, a cycling advocate from Beaver County. Quigley has been involved in memorial rides and setting up ghost bikes (bicycles painted white to mark a location where a cyclist died) in Beaver County and western Allegheny County. 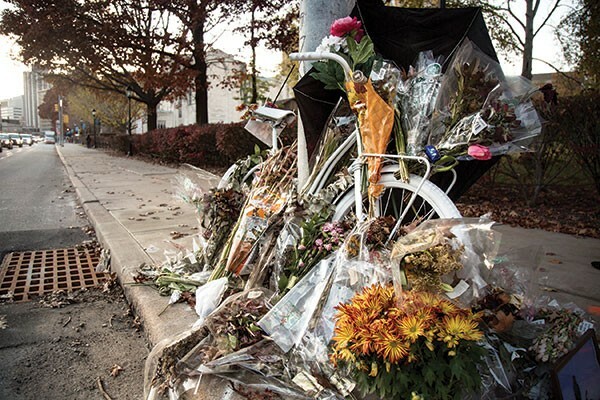 Four cyclists have died in the region since 2013, and three of those died on an eight-mile stretch of State Route 51, which is designated a State Bicycle Route by PennDOT. PennDOT Bicycle and Pedestrian Coordinator Roy Gothie says that at a September meeting, PennDOT requested that a bicycle subcommittee re-evaluate the segment of Route 51 where crashes have occurred.